Elsa, Anna, and Olaf continue their icy adventures in highly anticipated new game. 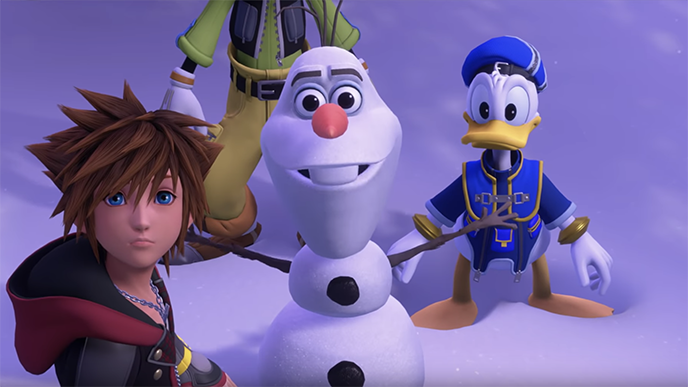 Frozen fans will be excited to see Anna, Elsa, and Olaf the Snowman in the new version of the popular game series Kingdom Hearts. When the trailer debuted at the Electronic Entertainment Expo -- America's biggest video game trade show -- the audience went wild as Elsa skated onto screen. Wreck It Ralph will also appear in Kingdom Hearts 3, as well as classic Disney characters like Mickey Mouse, Donald Duck and Goofy. The kid with the brown spikey hair is Sora, the main character in the series, who wrangles all manner of characters in an effort to ward off bad guys and make their fictional world a better place. Disney owns this action role-playing game franchise, but the game is created by a well-known Japanese deveoper, Square Enix, and nearly all of the Kingdom Hearts games have been critical and commercial darlings. Fans have been waiting a long time for this new installment, and we predict this game will also find many new fans in the next generation of gamers. Kingdom Hearts 3 will be available starting in January for PlayStation 4 and Xbox One.